There's nothing quite like freshly baked rolls. 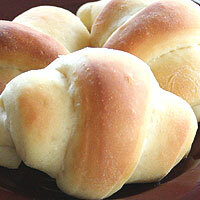 These delicious rolls are a must for holiday meals, or a good Sunday dinner. Instructions for whole wheat rolls are also included. 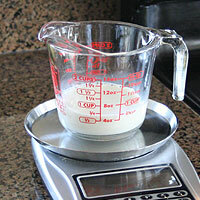 Measure a little more milk than called for in a microwave safe container (some will evaporate). Scald the milk by microwaving it until it boils rapidly but doesn’t overflow, about 1 ½ minutes. Let cool to 105-115 degrees. When the temperature is correct re-measure the milk and add the instant yeast and mix well. Cover and set aside 5-10 minutes. 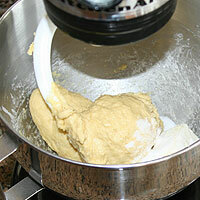 Measure the flour and eggs in a stand mixer or in a large bowl if mixing by hand. When the milk is ready add it to the flour and knead until just combined. The proteins in un-scalded milk attack the gluten, scalding breaks these proteins down. If you donâ€™t have a thermometer, go by touch. It should be the temperature of a hot bath, however if the yeast is added above 115 degrees it will kill some of the cells. Adding it when itâ€™s colder is fine, but it will take longer to rise. Normally instant yeast doesn't need to be hydrated. This first dough however is dry and the yeast won't be activated soon enough if it isn't. If you use active dry yeast, use 1/8 t more. The dough will be very stiff and dry. Cover with plastic wrap and autolyse (let it rest) 15-20 minutes. The wheat dough will be a little stickier at this point, but by the end of the autolyse, it will be drier. Measure the sugar, salt, and butter. If the butter is hard, microwave it for 10 seconds or until softened but not melting. Add to the dough and knead 5 minutes. 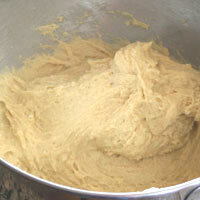 The dough should be sticky and will not clean the sides of the bowl. The wheat dough should be a similar consistency to the white, just a bit stiffer. Even though it's sticky, it should be able to hold a shape when you form it into a ball. Cover and rise 90 minutes. It should double in size. Spray a cookie sheet with cooking spray and set aside. On your work surface, mark off an area 35 inches in length and 10 inches in height. If you have a canvas mat, flour it. If not, spray the work surface with cooking spray and lightly coat with flour. 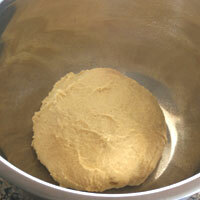 Remove the dough from the bowl and stretch it in the air as far as you can before it tears. Set on prepared surface and lightly flour the top. Roll out in a rectangle 30 inches long and 8 inches tall. Try to make the dough an even thickness throughout. With a pizza cutter, cut all edges to make an even rectangle. 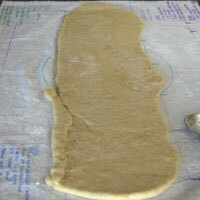 Add the cut pieces any thin spots, or place evenly in the middle of the dough. An even thickness is important to forming even rolls. A piece of dough even a little thinner will look a lot different from a thicker piece. It is difficult to make an even thickness, just get it as close as you can. With the pizza cutter, slice the dough diagonally to form 12 even rolls. Add the dough on the ends to any weak spots. 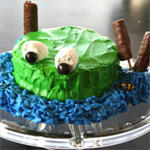 Each piece should be 4 1/2 -5 inches on the top and come to a sharp point on the bottom. Starting at the wide end, roll each piece compactly (not loose, but not too tight). Place on prepared cookie sheet with the point facing down almost touching the cookie sheet. Cover them loosely with plastic wrap, but seal the edges well. This gives it room to rise, but encloses it so it won't dry out. If the point is on the top, the roll will break open during cooking. Sometimes they will completely unravel. The point should touch the pan or be slightly tucked under. I have three methods listed for the final rise. My favorite is the overnight refrigeration. 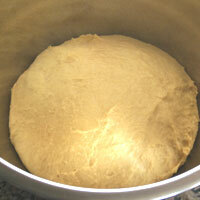 The dough rises very slowly for up to 12 hours in the fridge. The slow rise improves the taste and texture of the dough. Also it's convenient to have the majority of the work and the mess done with the day before baking. The rising time depends on the temperature of the room. They will rise much faster in a warm place. To speed the process, place a heating pad under the pan. Remove 2 hours before baking. Re-lay the plastic wrap loosely on top. Remove plastic wrap and pre-heat oven 20 minutes before baking. Bake the rolls at 350 for 15 minutes. They should be browned on the top and cooked through. Immediately remove them from the hot pan and place them in a cloth lined basket or bowl. Serve hot. If you plan to serve them later, cool completely on a cooling rack. Place them in plastic bags until use. Baking the rolls at a higher heat (even just 25 degrees hotter) over-bakes the tops before the insides are done. 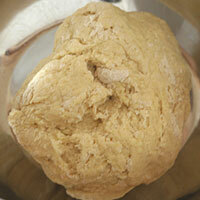 The dough will be stickier after the first knead because wheat flour takes longer to absorb liquid than white flour. After the autolyse the dough will be very stiff. With the additions of the butter, sugar and salt, the dough will be soft and sticky. It should hold a soft shape just like the white dough. The consistency will be very similar to the white rolls, just a bit stiffer. 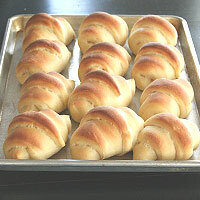 Rise, shape, rise, and bake just as you would the white rolls. 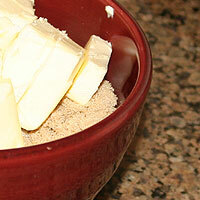 Hard Butter- The butter in the dough can be a problem if it is hard. 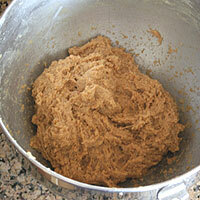 It will not mix properly and the dough will be lumpy rather than smooth. 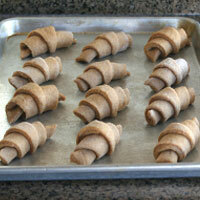 Too little flour- The dough should be very sticky, but if the rolls won't hold a shape, it doesn't have enough flour. 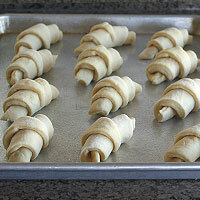 Too much flour- With too much flour, the rolls will be dense, dry, and unable to rise properly. 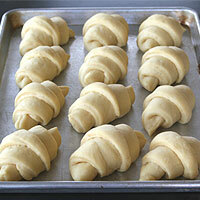 Overproofing- If the dough or the rolls are left to rise too long it will overferment. This produces a yeasty taste. They also may deflate before getting them in the oven. 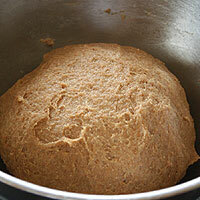 Underproofing- Underproofed dough will have a tight crumb, making them too dense. 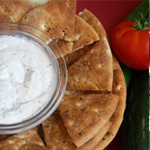 Shape- The crescent shape is ideal for this recipe. When I have made them round-shaped, they aren't as light and just not as good. I will post a different recipe for round rolls sometime. 1. Measure a little more milk than called for in a microwave safe container (some will evaporate). 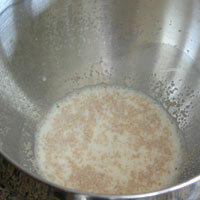 (1)Scald the milk by microwaving it until it boils rapidly but doesn’t overflow, about 1 ½ minutes. Let cool to (2)105-115 degrees. When the temperature is correct re-measure the milk and add the (3)instant yeast and mix well. Cover and set aside 5-10 minutes. 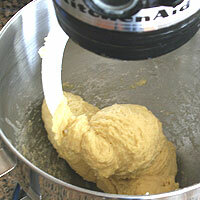 Measure the flour and eggs in a stand mixer or in a large bowl if mixing by hand. When the milk is ready add it to the flour and knead until just combined. The dough will be very stiff and dry. Cover with plastic wrap and autolyse (let it rest) 15-20 minutes. 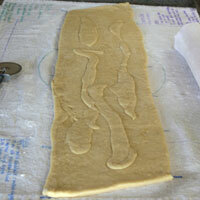 The wheat dough will be a little stickier at this point, but by the end of the autolyse, it will be drier. 2. Measure the sugar, salt, and butter. If the butter is hard, microwave it for 10 seconds or until softened but not melting. Add to the dough and knead 5 minutes. The dough should be sticky and will not clean the sides of the bowl. Even though it's sticky, it should be able to hold a shape when you form it into a ball. The wheat dough should be a similar consistency to the white, just a bit stiffer. Cover and rise 90 minutes. It should double in size. 3. Spray a cookie sheet with cooking spray and set aside. On your work surface, mark off an area 35 inches in length and 10 inches in height. If you have a canvas mat, flour it. If not, spray the work surface with cooking spray and lightly coat with flour. Remove the dough from the bowl and stretch it in the air as long as you can before it tears. Set on prepared surface and lightly flour the top. Roll out in a rectangle 30 x 8 inches. 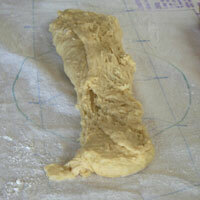 Try to make the dough an even (4)thickness throughout. With a pizza cutter, cut all edges to make an even rectangle. 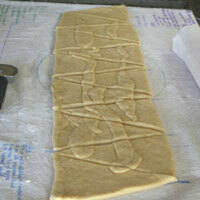 Add the cut pieces any thin spots, or place evenly in the middle of the dough. With the pizza cutter, slice the dough diagonally to form 12 even rolls. Add the dough on the ends to any weak spots. Each piece should be 4 1/2 -5 inches on the top and come to a sharp point on the bottom. Starting at the wide end, roll each piece compactly (not loose, but not too tight). Place on prepared cookie sheet with the (5)point facing down almost touching the cookie sheet. Cover loosely with plastic wrap and rise 1 hour. After 40 minutes, remove the plastic wrap and pre-heat the oven to 350. Bake as instructed below. Cover them loosely with plastic wrap, but seal the edges well. This gives it room to rise, but encloses it so it won't dry out. Refrigerate overnight. Remove (7)1-2 hours before baking. Re-lay the plastic wrap loosely on top. 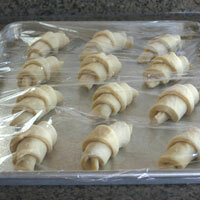 Remove plastic wrap and pre-heat oven 20 minutes before baking. Set the shaped rolls on a greased plate or a cookie sheet if it will fit in your freezer. Cover completely in plastic wrap and freeze a few hours until frozen through. Store in a freezer bag or container. 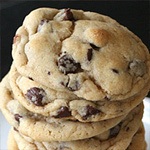 To thaw you can refrigerate them overnight and follow the above instructions. You can also remove them 3 hours before baking and place on a greased cookie sheet to thaw and rise. Cover loosely with plastic wrap. Remove wrap and pre-heat oven 20 minutes before baking. 5. Bake the rolls at (8)350 for 15 minutes. They should be lightly browned on the top and cooked through. 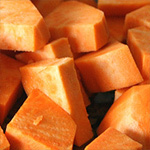 Immediately remove them from the hot pan and place them in a cloth lined basket or bowl. Serve hot. 1. The proteins in un-scalded milk attack the gluten, scalding breaks these proteins down. 2. If you donâ€™t have a thermometer, go by touch. It should be the temperature of a hot bath, however if the yeast is added above 115 degrees it will kill some of the cells. Adding it when itâ€™s colder is fine, but it will take longer to rise. 3. Normally instant yeast doesn't need to be hydrated. This first dough however is dry and the yeast won't be activated soon enough if it isn't. 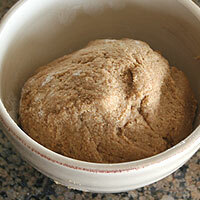 If you use active dry yeast, use 1/8 t more. 4. An even thickness is important to forming even rolls. A piece of dough even a little thinner will look a lot different from a thicker piece. It is difficult to make an even thickness, just get it as close as you can. 5. If the point is on the top, the roll will break open during cooking. Sometimes they will completely unravel. The point should touch the pan or be slightly tucked under. 6. I have three methods listed for the final rise. My favorite is the overnight refrigeration. The dough rises very slowly for up to 12 hours in the fridge. The slow rise improves the taste and texture of the dough. Also it's convenient to have the majority of the work and the mess done with the day before baking. 7. The rising time depends on the temperature of the room. They will rise much faster in a warm place. To speed the process, place a heating pad under the pan. 8. Baking the rolls at a higher heat (even just 25 degrees hotter) over-bakes the tops before the insides are done.